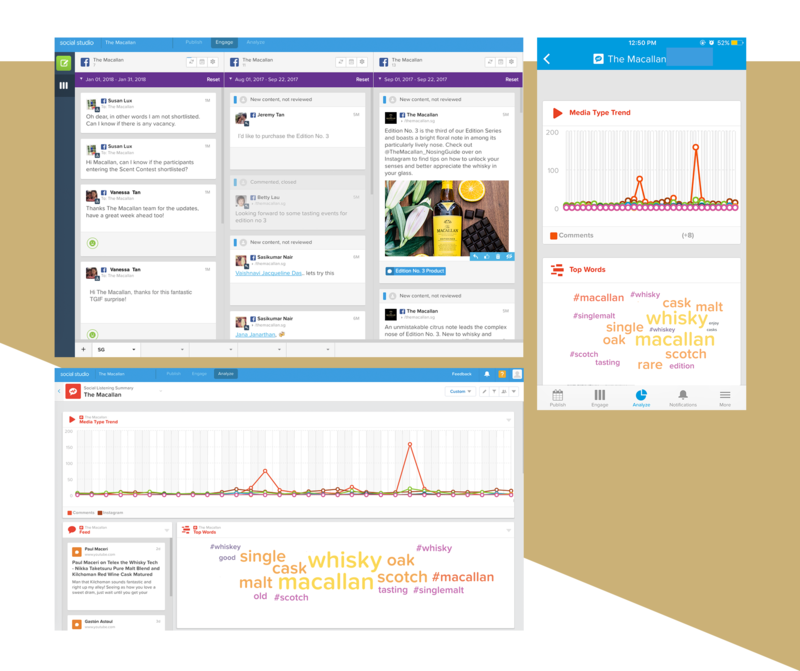 Implementation and configuration of a powerful social media listening, publishing and management interface to manage The Macallan’s social marketing and community management, as well as gather social listening insights. Objective The Macallan is a luxury spirits brand that features an exceptional portfolio of some of the world’s finest single malt Scotch whiskies. 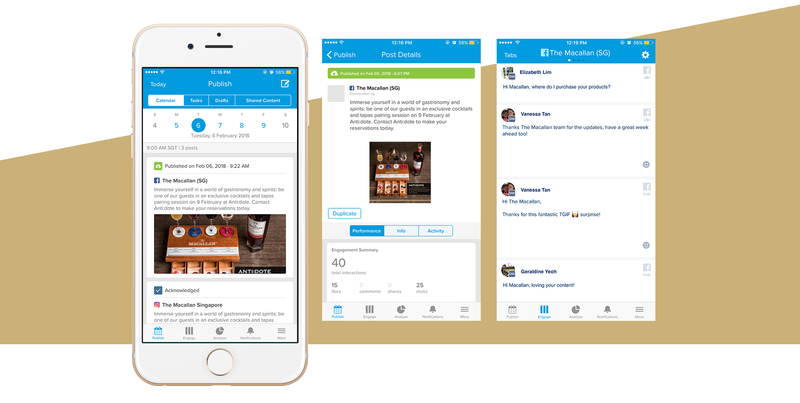 With the brand’s latest global adoption of Salesforce Marketing Cloud - Social Studio, all social media content publishing, campaign monitoring and community management were to be managed from one unified interface for consistency and collaboration throughout its markets. Xpointo Media was tasked with using innovative and best practice methodologies to leverage Salesforce Marketing Cloud - Social Studio’s comprehensive functionalities to meet the brand objectives. APAC: The global team provided assets that were rolled out to all markets according to their global marketing plan for the year. The Macallan APAC team had to ensure a consistent content direction and timeline with the rest of the markets, alongside managing the communities of the respective social pages. In addition, we were able to track monthly insights on current social chatter of the brand and competitors in the market through social listening. GLOBAL: Performance reports of digital initiatives in the various markets reflected different reporting metrics. This resulted in the inability to have a coherent comparison across all reports. The global market leaders requested for a standardised best practice reporting template including metrics to align all reports for all markets. Solution APAC: With the implementation of Salesforce Marketing Cloud - Social Studio, the objectives were executed through three subsections within the platform: Publish, Engage and Analyze. All global assets could be accessed within the platform. In Social Studio: Publish, content managers could localise (according to time zones and language), schedule, send for approval and publish all assets to the various social media channels and their specific markets. This way, the client could access and see an overview of all content to be published for the month. Social Studio: Engage enabled the team to monitor and engage their community on the multiple social networks. The community managers could then identify loyal whisky fans and assign queries that may require further information from the respective market managers. 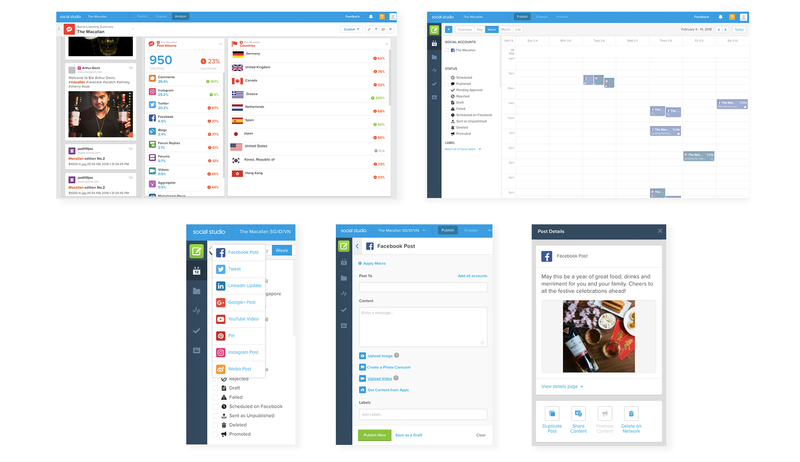 To track social chatter online, we set up keywords to conduct social listening on Social Studio: Analyze. This was especially helpful to garner intelligence during our ideation process – trending innovations for events, success of competitors’ campaigns – for upcoming launch campaigns. GLOBAL: Targeted at the global market leaders, we developed a global report template that would align reporting metrics for all markets to follow. This template harnessed the reporting potential of Salesforce Marketing Cloud: Social Studio and consisted of best practices to monitor and measure the success of individual market’s digital initiatives. Apart from the standardisation of the metrics, the recommended report template aimed to produce critical insights on the digital performance of each market, to assist the country managers in planning their marketing initiatives.